A Liberty legend, Teresa Weatherspoon joined the New York Liberty in the WNBA’s inaugural season in 1997 after being selected 10th overall in the inaugural WNBA Elite Draft. A four-time All-Star, she helped guide New York to four WNBA Finals appearances (1997, 1999, 2000, 2002) and was inducted into the Liberty Ring of Honor in 2011. Weatherspoon was a four-time All-WNBA Second Team selection and two-time Defensive Player of the Year (1997, 1998) during her eight-year career, averaging 5.0 points, 3.1 rebounds and 5.3 assists per game. She is the Liberty’s all-time leader in assists (1,306) and steals (453), and ranks ninth in WNBA history in assists and 19th in steals. Following seven seasons with the Liberty, Weatherspoon signed with the Los Angeles Sparks in 2004, retiring at the end of the season. Named one of the Top-20 best and most influential players in WNBA history in 2016, she was also the first player in the league to post 1,000 points and 1,000 assists for her career. Orchestrating what may be the most remarkable play in WNBA history, Weatherspoon hit a shot from midcourt as time expired in game two of the 1999 WNBA Finals against the Houston Comets, staving off elimination for the Liberty and forcing a decisive third game to decide the championship. A 2010 inductee into the Women’s Basketball Hall of Fame, Weatherspoon enjoyed an equally decorated collegiate career, leading the Louisiana Tech Lady Techsters to a National Championship in 1988. A two-time All-American, she won the Wade Trophy (National Player of the Year) and was a Gold medalist at the 1988 Olympics in Seoul, South Korea, and won a Bronze medal at the 1992 Olympic Games in Barcelona, Spain. Weatherspoon began her coaching career as the head coach of the Westchester Phantoms of the American Basketball Association in 2007. In 2008, she joined the coaching staff of Louisiana Tech, where she was the head coach from 2008-2014, leading her alma mater to three postseason berths, including back-to-back Western Athletic Conference titles and NCAA Tournament berths in 2010 and 2011. After serving as a consultant with the New York Liberty during the 2014 WNBA season, she joined the coaching staff as the first Director of Player Development in franchise history for 2015. In 2016, she was named also named the Director of the Liberty Basketball Academy. As the Director of Player Development, Weatherspoon focuses on court instruction, individual workouts with Liberty players, and scouting opponents. 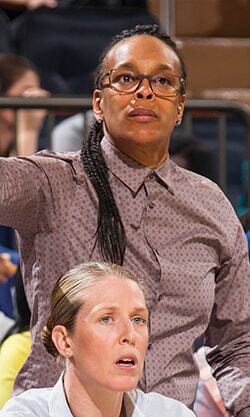 Her work with the Liberty Basketball Academy results in the oversight of all youth instructional programs and camps. Prior to the start of the 2017 season, she was named Director of Franchise Development, undertaking a larger role in the Liberty’s front office, contributing to off court and team business initiatives.